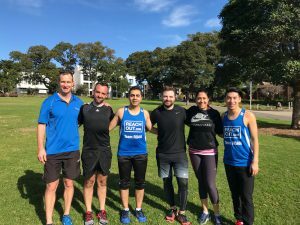 In 2017, Longevity Personal Training and Exercise Physiology will have another record number of clients, friends and fundraisers preparing for the City2Surf. Once again, I thought it would be pertinent to pass on some of my advice as a former distance runner turned sprinter on some of the do’s and don’ts of the world’s most popular fun run. Jarrat Wood with some of the fundraisers for the ReachOut Organisation: https://au.reachout.com. I first competed in the City2Surf when I was 16. I was fortunate to enough to be sponsored by the Department of Sport and Recreation and it was quite the adventure travelling to Sydney for the first time by plane (12 seater) from Gunnedah. Start line: Arrive early and dress warmly. Arrive early so you have time to do a warm-up and then dump your clothes for transport to Bondi and then move to a start position. If you leave your warm-up too late you will be stuck behind the crowd. If you go early make sure you wear an old jumper you can toss to the side of the road once the gun goes. All discarded clothing is collected and distributed to charity so you’re staying warm and doing a good thing for those less fortunate. I have used the transport service before and never had any trouble. I often throw $20 or so in my trackpants pocket so I have enough money to catch a cab or buy something if necessary at the finish line. It can save waiting in the bus line. When the gun goes, unless you are right at the front of your group just relax! It’s going to take a while to even cross the start line so don’t waste any energy getting too excited and pushy. Wait until you cross the line and then find the cleanest piece of path you can to find a rhythm. This may be on the median strip or on the pavement but a clear path that is off the main running line can often be more beneficial than trying to run the shortest possible distance. If you run at a good tempo you should see the crowd thin as you go and you can then adjust to a more direct race line. Email info@longevitypt.com.au to claim your complimentary Longevity health and fitness assessment. The first 6km: This includes a downhill start and many undulations until the start of “heartbreak hill”. Don’t get carried away with a fast pace in this early section. There is plenty of time to make up a slow pace later in the race but if you hit the hill and you are already working close to your maximum you will be found out and you will cost yourself a lot of time. It’s always better to run a little off pace (5-15secs slower per km) in this early part as a good hill can make up all that time and then some. Magic Moment: Make sure you take the time to take a look back when you hit the William St tunnel. The noise of the footsteps and the view of the thousands of runners is always enjoyable and relaxing. It’s one of the highlights of the run. The music coming from the Golden Sheaf Hotel is also a highlight. The hill covers the best part of a full kilometre. Pacing is the critical element here and it’s important to relax and find a steady pace. Heartbreak hill has many false peaks so relax because it will take a while to conquer this one but if you get your pacing right and are in good shape at 8km you have set yourself up for a great result. This section of the race caught me out on my first time at the City2Surf. I grew in confidence after heartbreak hill and went a little too hard through this section. The constant undulations had me in a lot of trouble. I held on but it probably cost me a bit of time. Make sure you relax through this section. There are a lot of twists and turns through the Vaucluse area and it can seem like a long way from Bondi but if you are feeling good you can also make up a tremendous amount of time. The crowds start to thin out, the toughest part of the race is behind you and the ocean beckons. If you can continue to work hard through to the 12km mark you then get to enjoy the easiest part of the race. Rolling down to Bondi through the 13th kilometre is an absolute dream and it is a fast kilometre even if you are exhausted. Remember to save a little bit of energy at the bottom of the hill once you reach Bondi as you have to run past the finish on the promenade and then take a u-turn to come back to the finishing shoot. It’s quite a tease actually, but the crowds will get you through it from that point. Organise beforehand a meet point with your friends/family. It’s a bit of a nightmare trying to get home but the main thing is to enjoy your efforts and relax and soak up the atmosphere of one of the greatest amateur events on the planet. It’s a great achievement to run 14km and to do it on such an amazing course is a privilege and a memory that you will have for life. Finally, if you have time, pop into see me. 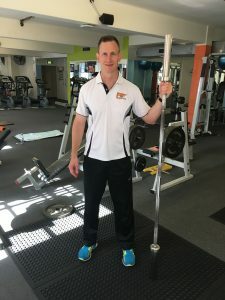 I will be catching up with some clients and Reachout fundraisers that Longevity has donated coaching services to as part of their preparation for this year’s event.